As a mercenary, I’ve learned to hate complications. “Developing situations” might be the technical term. It could be anything. Maybe you send down your Lance, your team of four mechs, for a simple mission only for enemy reinforcements to emerge from the forest. Maybe you finish up a hard-fought battle, return to base, and your employer turns and fires a few shots into your back. Maybe the “lightly defended” outpost is hiding a mech twice your size. The circumstances don’t matter, because the outcome is the same. Complications get you killed, or at least put you out of commission so long you might as well be dead. When money is the lifeblood of a mercenary company, the two are basically synonymous. I’ve been playing BattleTech ($40 on Green Man Gaming, Steam, and GOG) off and on for around a year now. Last May, Harebrained Schemes released a multiplayer beta for people who helped crowdfund the project, and I’ve put in some long hours with it. 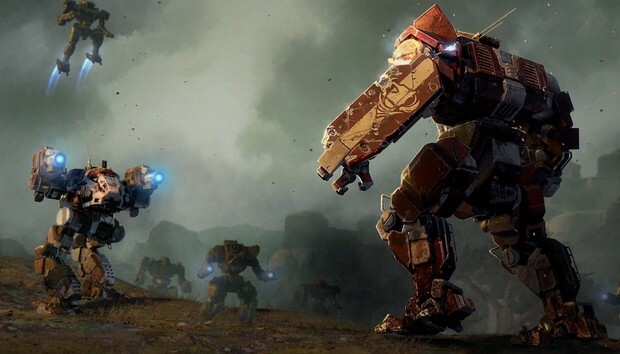 Enough to know it’s one hell of a tactics game, 55-ton mechs with all manner of missile launchers and ballistic cannons and laser beams duking it out in one-off battles. That component, “Skirmish,” still exists. But it’s the low-stakes version of BattleTech, a sort-of tactical playground with no consequences. Not like the campaign. 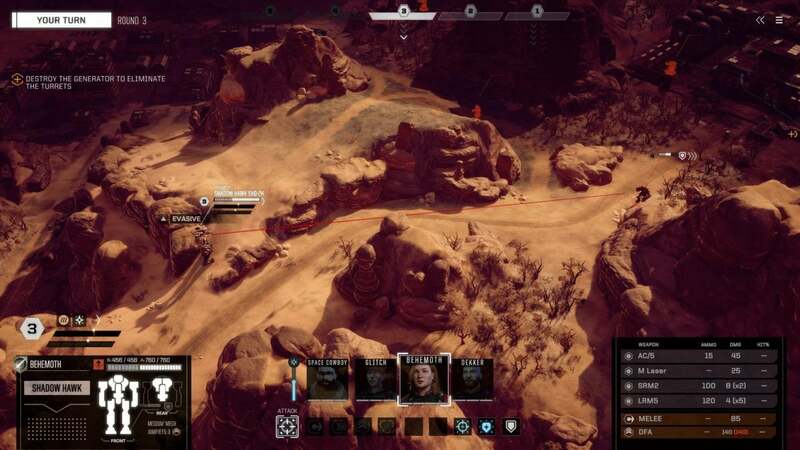 For years, Harebrained has teased BattleTech’s campaign, a space opera spanning an entire galaxy, full of backroom intrigue and politicking, coups and military engagements, betrayals and sabotage. Then there’s you: A mercenary, one of the lowest of low rungs on the ladder. You’re stuck trying to navigate it all. Shortly after BattleTech starts you’re given control of a small ship, an even smaller crew, and a mountain of debt. It’s up to you to keep the ship running—to keep your mechwarriors happy, their mechs repaired, and the debtors of your back. And indeed, that is the heart of BattleTech. Most missions consist of, in some order, blowing enemies up and occupying ground. Sometimes you’ll rescue an important target, evacuating them to a dropship. Pretty simple stuff. 15 hours in, I’ve yet to see the same mission twice though. BattleTech has a remarkable ability to put these building blocks together in new and novel ways—and, as I said earlier, complicate them. Multiple times I thought I signed on to a fairly straightforward mission only for the situation to turn at the last minute, resulting in a desperate fight for my life. Four building-sized mechs aren’t nearly mobile enough to escape when things turn bad. In any case, the responsibility falls on you. You choose the contracts, you read the intel briefings, and you decide whether the rewards are worth the danger. That last element is most important. See, BattleTech’s persistence doesn’t just manifest in your finances. The campaign also makes you keep track of your mechs and their accompanying pilots. Took a beating in the last mission? Repairing your mechs might end up costing more than you made, especially if you manage to lose an arm or a couple of weapons in the process. Mechs also need pilots, so best make sure your talented crew doesn’t take injuries. Those require time in the med bay—time you don’t have. Every day you spin your engines waiting for pilots to recover and repairs to be done, you’re burning cash. Run out of cash and your mercenaries will go their separate ways. That’s effectively game over. 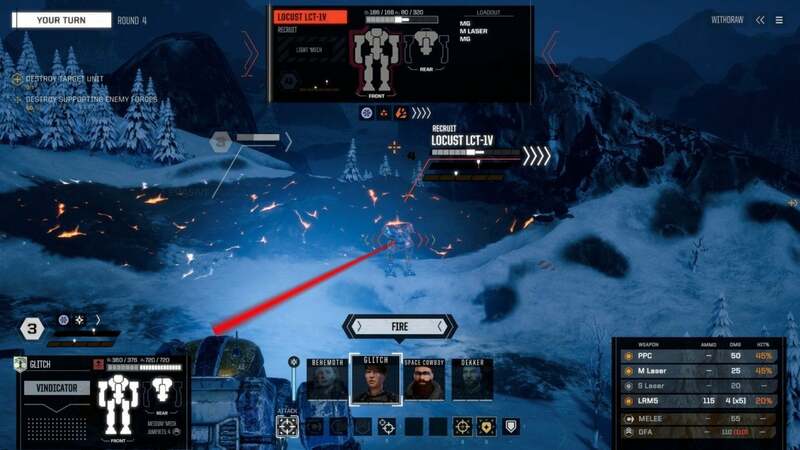 It’s tense, and BattleTech throws you in the deep end. Early on you’re running on a shoestring budget, which makes every mission feel like life or death. Your mechs are weak and underpowered, you’ve barely got a handle on tactics, and it’s possible to make some extremely costly mistakes. Position a light mech poorly even once and you could be staring at a massive bill. Later you’ll have more slack (and more mechs) which helps immensely. I’ve just recently reached a point where my roster is long enough that one mech can be decommissioned and another can immediately take its place. But I’m still only four “months” from insolvency. It’s not much, especially when repairs can take 15 to 20 in-game days. That’s a lot of downtime. I’m really enjoying it though, both the managerial side and the actual tactics-laden missions. 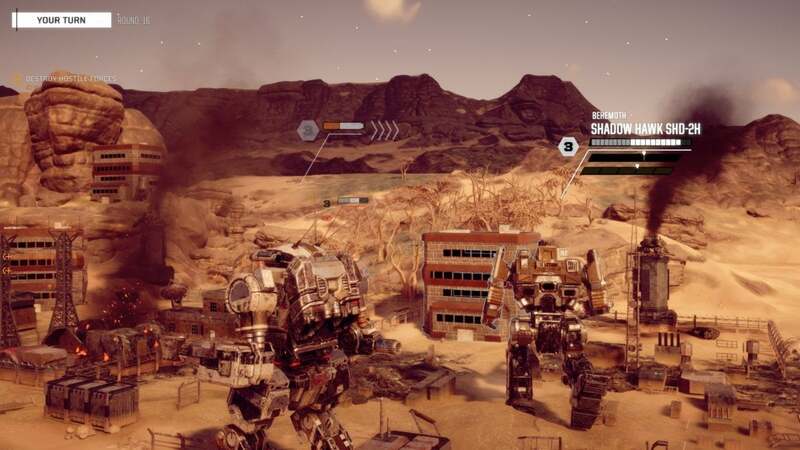 BattleTech feels as satisfying on the latter front as it did a year ago, with a deep and thoughtful roster of mechs that open a bunch of options. Do you want to go all snipers, firing from afar? Maybe focus on cannons, which build up less heat and thus are great for deserts? Or maybe—my favorite—build everyone into melee monsters, enjoying the overblown spectacle of 50-foot machines flying through the air and punching each other in the face. It’s easy to enjoy the spectacle, too. 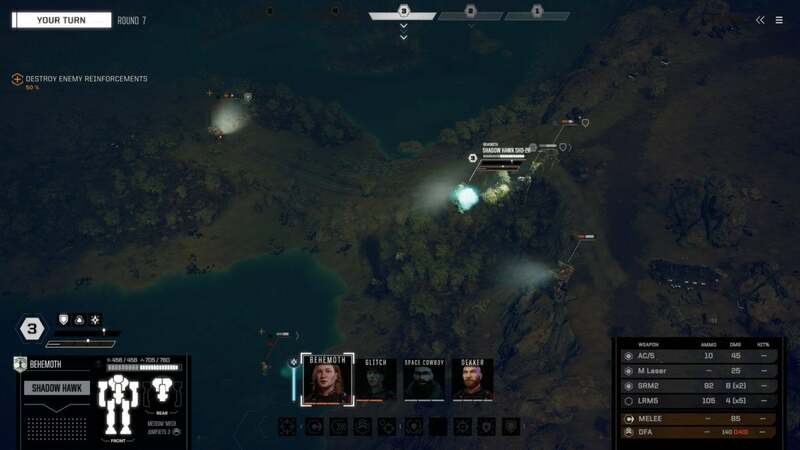 As I wrote last year, BattleTech has an uncanny ability to convey scale even from its eye-in-the-sky tactical perspective. I still haven’t tired of seeing mechs “taking cover” in enormous old-growth forests, where each movement results in trees snapping like matchsticks. The cinematic camera can also be fantastic when everything lines up properly, shots arcing in front of a setting sun or silhouetting a row of encroaching enemy forces on the side of a frosty mountain peak. That said, BattleTech has its share of problems. Some of these seem easy (or easier) to rectify. Namely, performance. In the few days I’ve had review code I’ve already seen three patches, each of which has noticeably improved the situation. On Friday, loading into a mission took upwards of 40 seconds even on an SSD. Now that time is down to about 20-30 seconds, which is still long given how often it occurs, but...hey, it’s an improvement. And that’s sort of the case with the whole game. Enemy turn times, post-mission loads, cinematic cameras, every aspect has improved since Friday. I assume that means there are further improvements coming down the pipe. At the moment though, BattleTech feels a bit rough-edged. The cinematic camera is probably the worst offender aside from the load times, often completely obscuring your view of the action behind a mountain. You can turn it off in the settings, but then you lose out on the times when it does look cool. Hard choice, there. I also think BattleTech could use a better, more in-depth tutorial. There are a lot of systems at play here. To give you an ever-present example: Each weapon you fire generates heat, and you can only build up so much heat before damaging your mech. The solution is to toggle weapons on and off as needed to stay under the heat threshold each turn. Environmental factors also contribute, so polar regions allow you to disperse more heat for example, as does standing in a pool of water. Cool, yeah? But there are so many small details like this, it’s almost impossible to take in from the short tooltips BattleTech gives you. Worse, there’s another set of combat tutorials that aren’t even addressed in context. Instead, they’re buried in a character’s dialogue tree after you’ve already gone through a handful of early missions. Make sure you read this stuff. 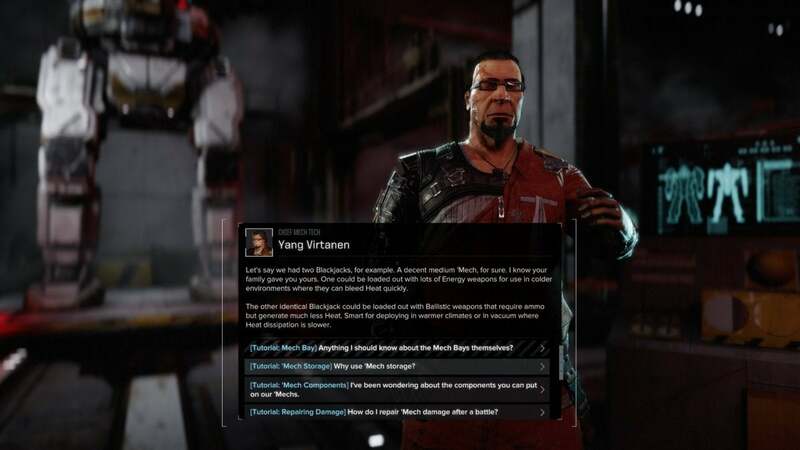 There’s something to be said for trial-and-error learning, but BattleTech can feel overly punishing in its early stages because it’s just not great at conveying information. Hell, even 15 hours into the campaign I sometimes find it hard to suss out whether a shot is going to completely take out an enemy or just do surface damage, because that information isn’t surfaced in an intuitive way. I don’t really have an idea how to fix it, but it’s one of BattleTech’s major failings. There’s a great game here, but it’s only great if people have the patience to learn its ins and outs. I still have quite a ways to go in BattleTech’s story I think. Even 15 hours in, I feel like I’ve barely scratched at it, and thus the scoreless review-in-progress. BattleTech seems like a safe bet though. The complaints I’ve listed above are small, or at least small to me. Performance is improving, and I don’t doubt within a week or two a lot of the jank will be gone. As for the tutorial’s shortcomings, they’ll doubtless be painful to those who didn’t experience the backer beta, as players try to learn both the tactical and managerial sides at the same time. It’s going to be hard for a lot of people, I think. But it’s worth it. 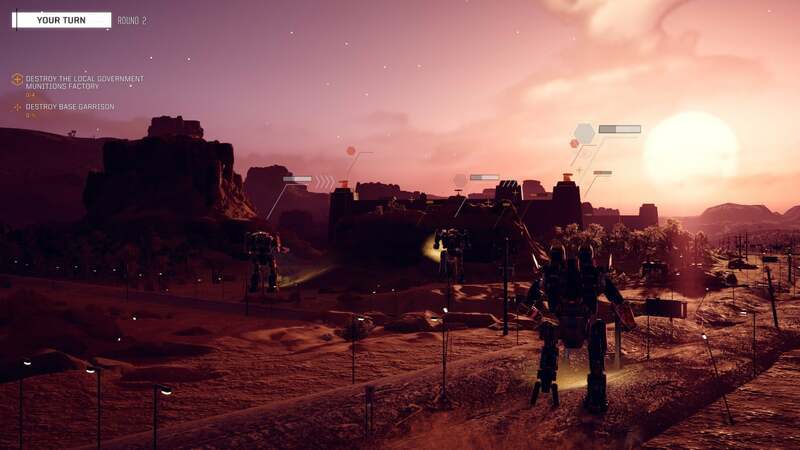 Underneath its intimidating exterior, BattleTech ($40 on Green Man Gaming, Steam, and GOG) is a fantastic tactics game couched in a strong and engaging fiction. Like XCOM, I’ve become overly invested in the lives of my crew. Protective even, trying my best to navigate the dangers of a succession war without losing any of them, or at least losing any of the ones who’ve been with me since the start of this whole mess. Get rich or die trying, right?